Spoke to Jimmy a short while ago who is responsible for the hail report at Lithgow in the current severe thunderstorm warning. Two interesting cells on radar at present, one between Lithgow ands Bathurst heading NNW, and another just SE of Goulburn barely moving NNE. Very round echo from Canberra radar at 0430z ! 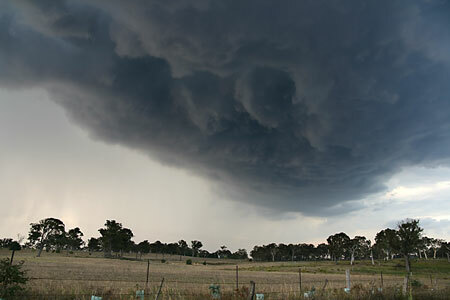 Well no photos from me unfortunately however I was watching the storm that formed near Moss Vale from the coast. 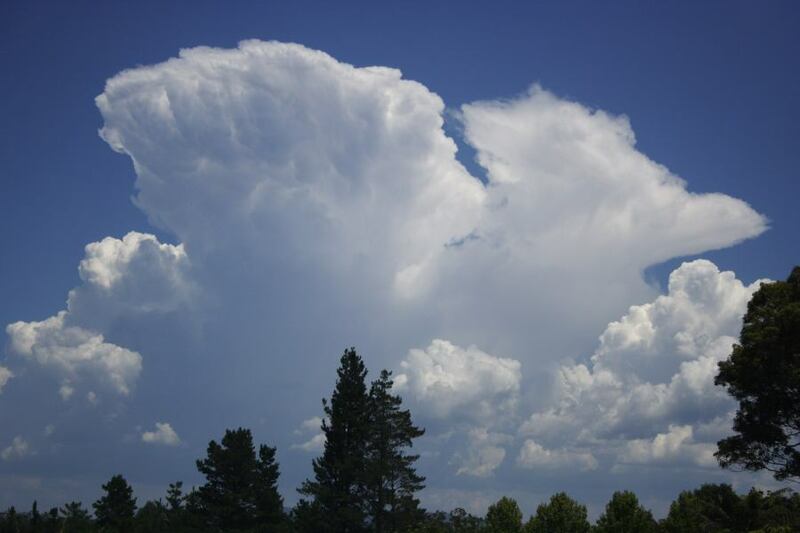 Looked quite nice for a while with quite a solid updraft and back sheared anvil. I didn't feel like the long drive south so opted west to Lithgow via Bell and Mt Victoria. 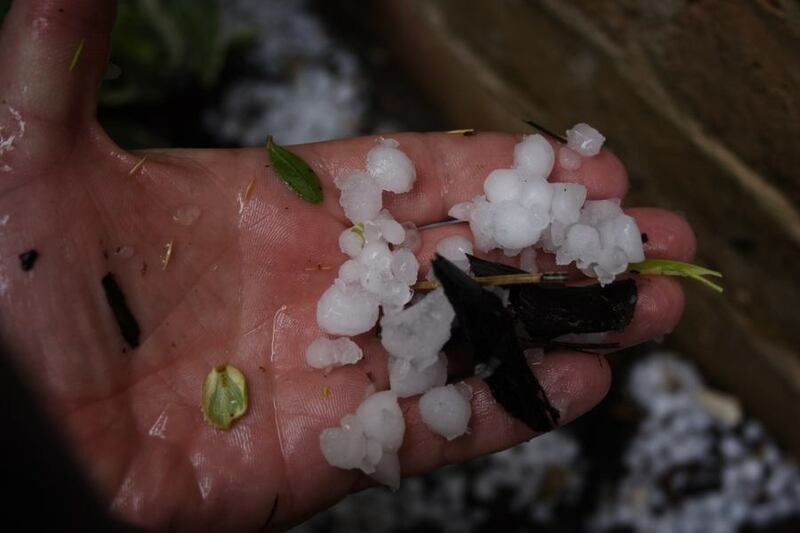 Smaller hail fell earlier in Lithgow itself but then a second precipitation cascade fell with larger hail in a deluge - no photographs but got it on video - I reported the hail up to 2cm. The pictures here are of hail 20 to 25 minutes later realising I had not photographed the hail. 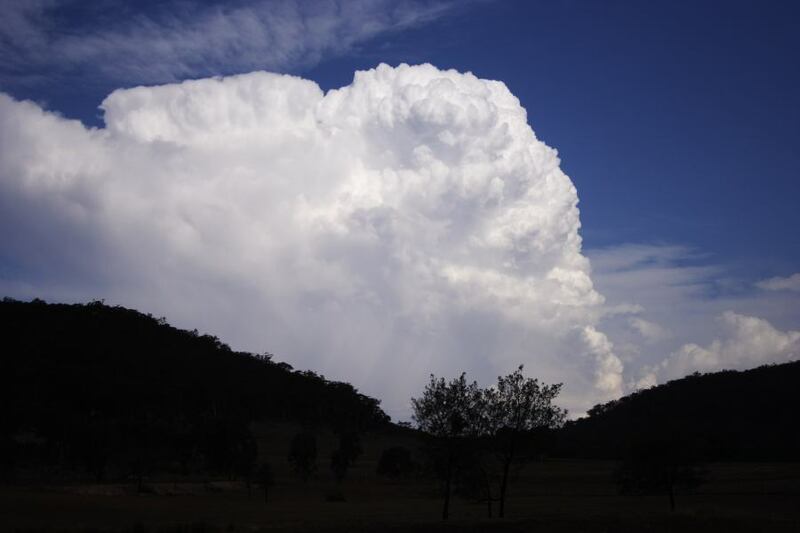 The second storm I attempted to chase toward Sofala but I did not like the environment so turned back and called Michael Bath to see if there was anything within the vicinity of Oberon and the mountains given I had observed what seemed like a decent updraft in that general direction. 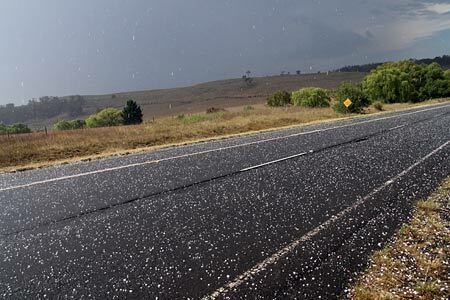 Meanwhile, the third storm near Sunny Corner had intensified and although I gave chase, I ran out of roads but got the second lot of hail cover as well as a hail fog. With fuel running low and having committed back to Sofala once again I did the round route with the options of heading to Mudgee. But the following updrafts of the final storm developed rapidly so I setup further south of Cherry Tree Hill and timelapsed the impressive updrafts. 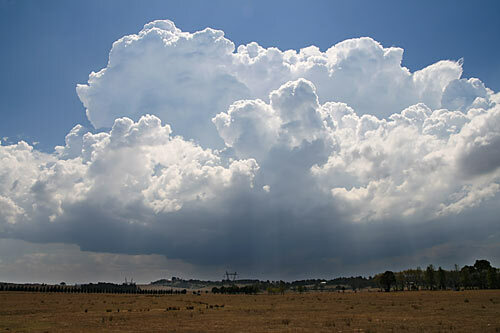 Investigated the weakish storms today on the Southern Highlands near Moss Vale. 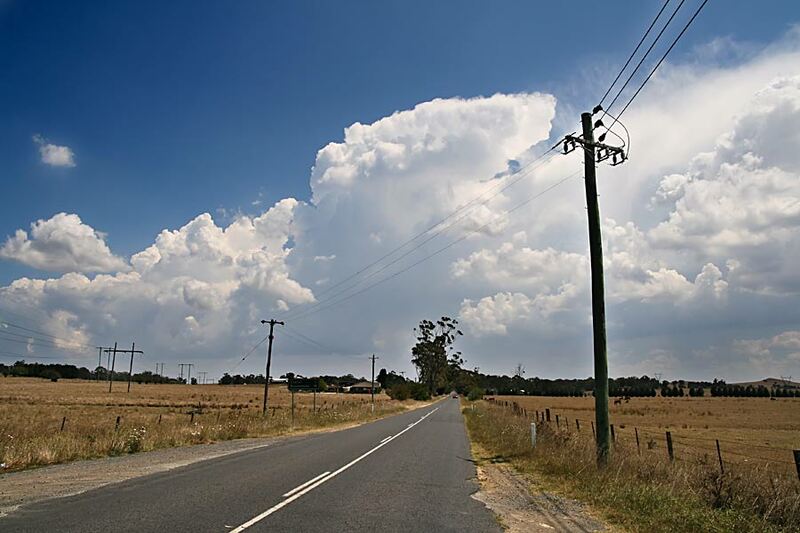 The first picture was taken just as I had chaser convergence with a Nowra crew - looking west from Moss Vale. We watched this line for about 20 mins. A congestus field then developed more to our NW in front of the earlier stuff, this field tapped better moisture on the seabreeze boundary. 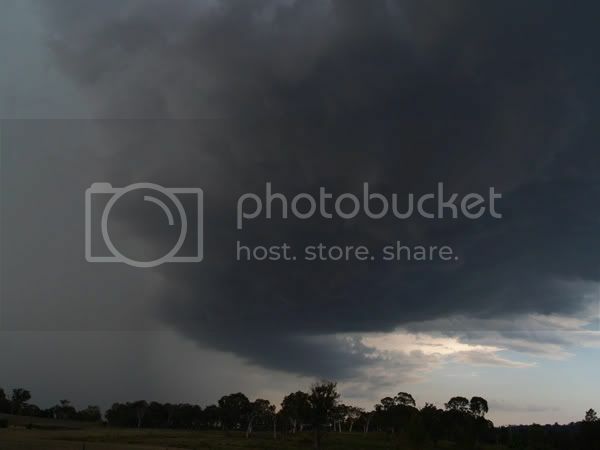 We drove to Berrima were we watched a decent rain free base for about 30 mins. The number of CG's was low considering the solid updraft above us. After a while the cell started to fall apart. I saw streaks from part of the remnant RFB northwards of Berrima and went to investigate. Small thumb nail to marble size hail was surprisingly heavy, with the odd larger stone. 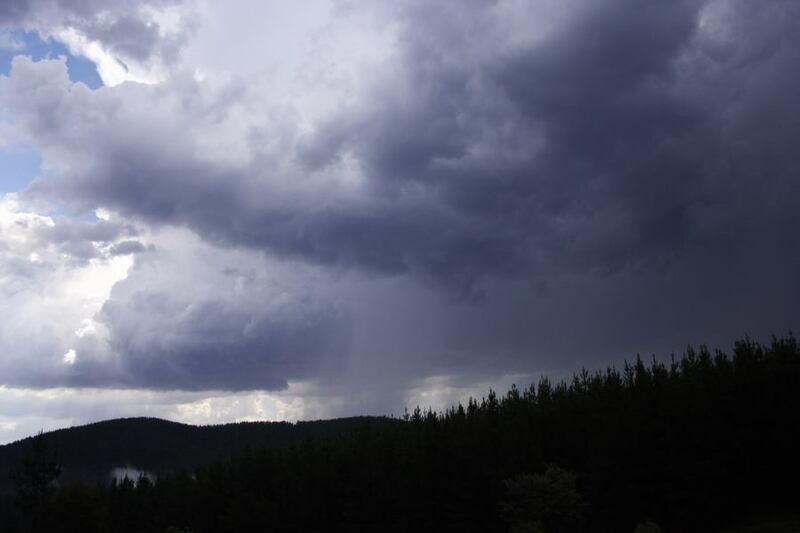 After a few minutes of child play in the hail I headed down the Hume towards Marulan. At Marulan I encountered the dying remains of the Goulburn cells - they were high based and not very photogenic. None the less there was a area between Goulburn and Marulan that has seen very heavy precipitation with minor flooding in some paddocks. It is cruel how these slow moving storms dump for some lucky farmers and missed others. Between Goulburn and Marulan some fortunate farmers had running water all over their paddocks, and their dams were filling from the flash flooding. 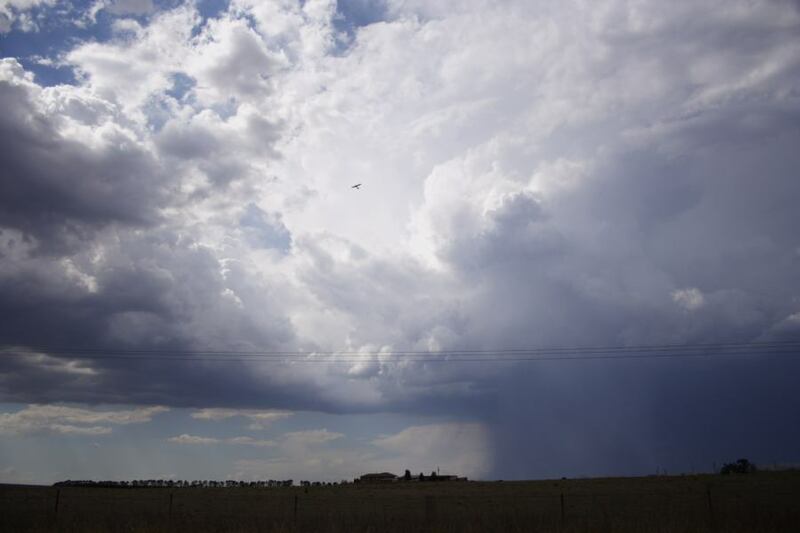 At Brayton north of Marulan ( where I tracked another poor storm ) a very much different scene. It looks that the countryside has missed every drop of storm rain in the last few months. The sheep were in a sorry site, scraggy and bone thin. Large areas of bare earth are showing in the paddocks. I headed home about 5pm, these cells where the suppercell variety ( all over by suppertime ). 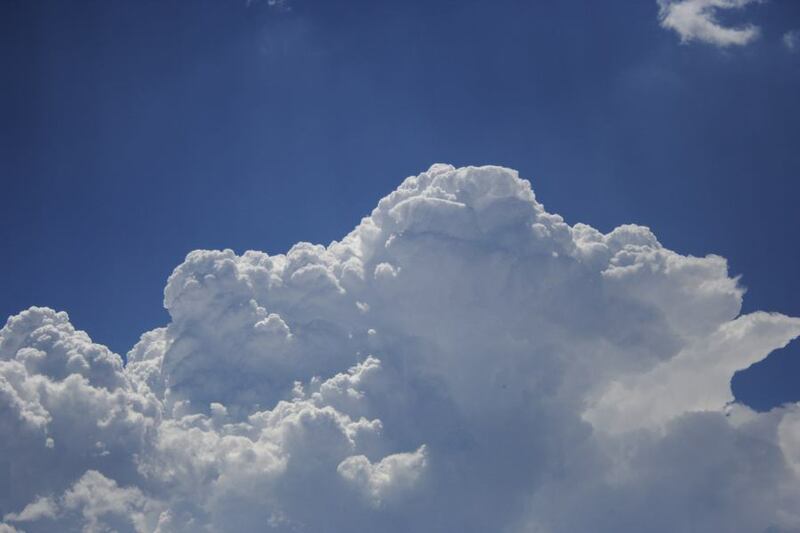 I caught glimpses of an updraft about 100km - 150km to my N/NW, I estimated in the Oberon and Lithgow area - at this stage this was the only active convection left in the entire sky. I expected better given the upper shear - not in the strength sense, which was ordinary at best - but in the sense that the anvils were taken N/NE, leaving eastwards of the storms nice and clear for a change, but I guess the sea breeze intrusion was too cool. What would you estimate to be the maximum sized hail. I estimated up to 2cm in the Lithgow case especially during the second pure barrage. However, when I went back 25 minutes later, the maximum I could get were about 1.5cm hailstones. I would think that most of the hail would have gone into some melt at this stage? I was judging the sound on my vehicle as having the odd larger thumps. We chased to the Southern Highlands today running into Michael Thompson near Moss Vale. Most of my report mirrors that of Michael Thompsons. 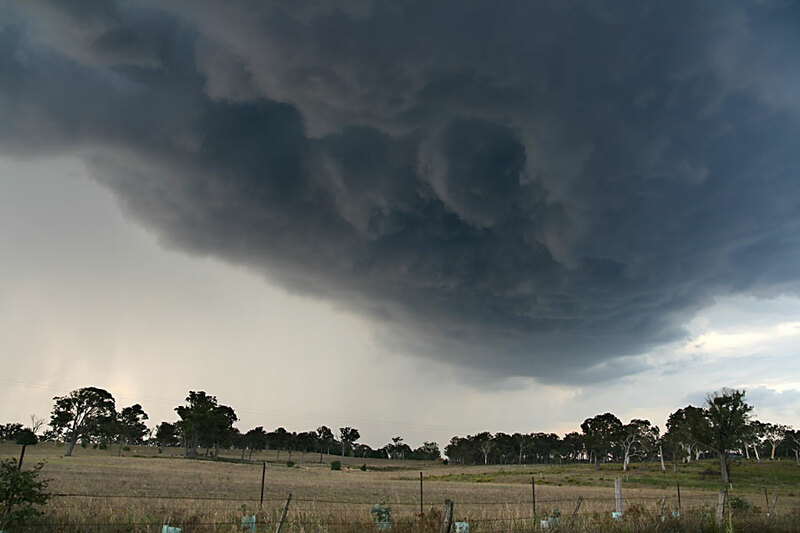 We encountered a storm near Berrima with a nice rain free base. 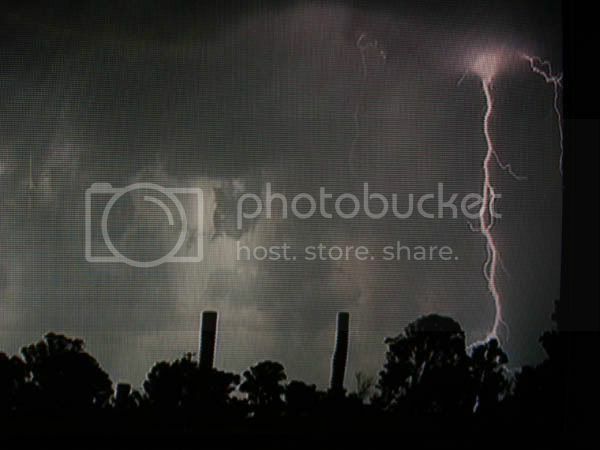 The storm didnt last that long and it only produced a handful of CGs which was a suprise. The storm died quite quickly and we went our separate ways. Michael wanted to go north briefly and I wanted to go south towards Goulburn. 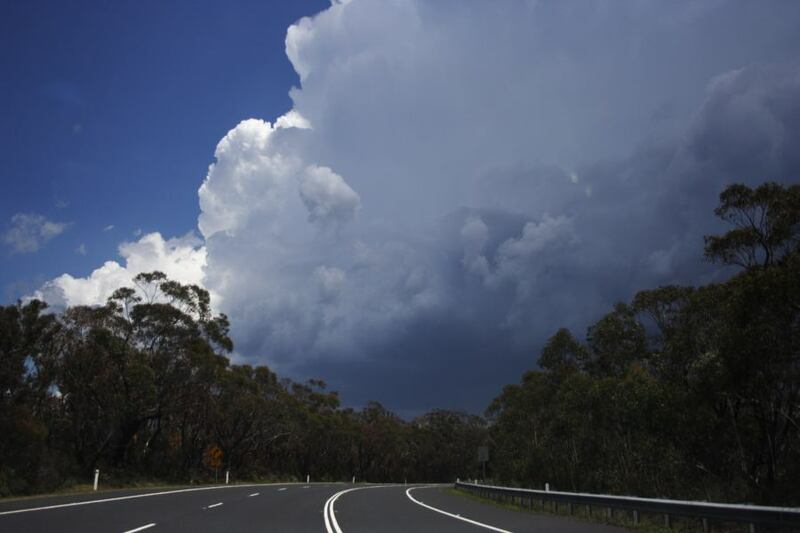 We encountered another storm near Marulan,it wasnt very photogenic and again the amount of CGs was very low. This storm can be seen below. 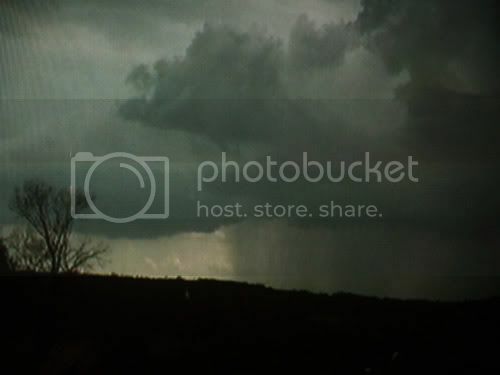 I decided to core punch it recieving some very heavy rainfall and small hail. 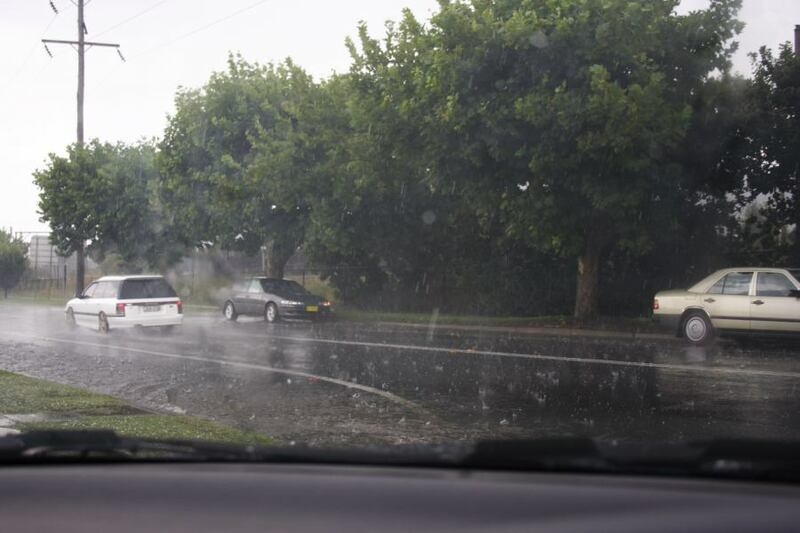 The majority of southbound traffic had stopped to wait out the deluge. We continued onto Goulburn and back into clear air again. Unfortunately it was a bad sight in Goulburn,the Bungonia storm died very quickly and everything to the south looked very ordinary. I called it a day and headed home. I like it when one is chasing and you encounter cars piled along the road under trees like a parking lot. I know that hail is nearby:) That happened yesterday near Lithgow on the Great Western Highway. I would have liked to know what they did afterwards when some of the large hailstones were dumped in a barrage - I would say it was some sort of hail dump as the storm was dead with 25 minutes. I had plenty of $2 dollar coin hail, the bigger stones were short of a 10C piece. I thought that hail was on the cards given the sounding with a rather dry slot in the mid levels. Like Jimmy and PingTang I also saw cars parked - under the trees at Berrima, they were probably wondering who the goose was that seemed to be avoiding the trees and even done a U turn to be on the opposite unshaded side of the road. 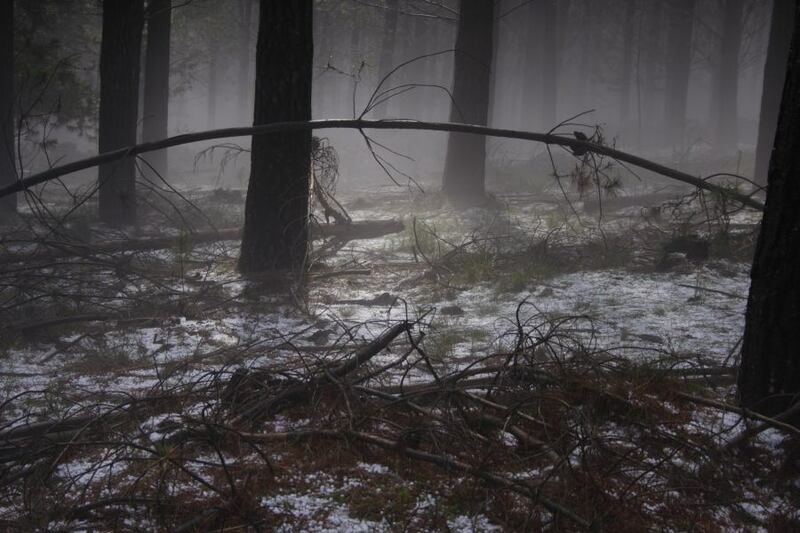 Yes it seems from the photographs that the hail were larger on the whole that I experienced. You should have phone in the report Michael and / or Pintang. I never had a chance to get accurate reports on hail size but im guessing we had 1-2cm hail at one stage. It was mostly just heavy rain and some flash flooding,including some rivers across the freeway! I dont think we core punched the heart of the storm though looking back at the radar archives. 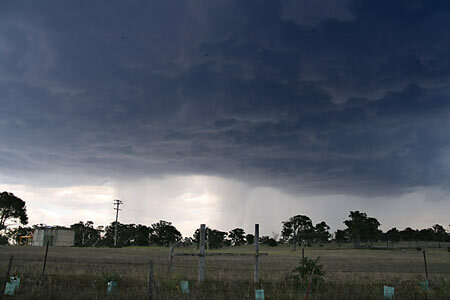 The heaviest precipitation was near Bungonia a good 15kms to our south at the time. I wouldent be suprised if that area recieved larger hail maybe in the 3-4cm range. This storm died very quickly,and its not suprising given the lack of shear.It basically went from black core to basically nothing in just half an hour. Classic pulse storm. Pity nobody did a damage survey of the region near there. The collapse behaviour was imitated in all cases on the day. I do believe that the higher reflectivities could have been the hail finally dropping during the collapse phase particularly if it occurred just prior to rapid weakening. Michael may wish to upload a links to the whole radar on the day. It would be interesting to see what was observed from the Lithgow storm at the least. Not trying to begin much of a discussion off-topic, but I notice that the two different radars seem to indicate different reflectivities for the same Bungonia storm. Does the Canberra radar over estimate or does the Sydney underestimate? Given close to similar sized hail were reported, the varying reflectivities. I guess you are only considering a distance of about 20 to 30km from the radars. Despite this, the reflectivities do indicate slightly highers reflectivities for the Bungonia storm. However, for those in the knowhow, how do the Blue Mountains interfer radar as compared to the region near Goulburn? I was watching these storms for much of the day and they were pulsing then quickly dying on the ranges after dropping precipitation shafts. Most of the storm cells had short life spans. However, you may / may not have been aware of a storm that developed south of Sydney at around 8 am. It tracked north / north east along the coast, clipping Cronulla and Randwick, peaking at around 8.30 am to 9.30 am before curving out to sea. 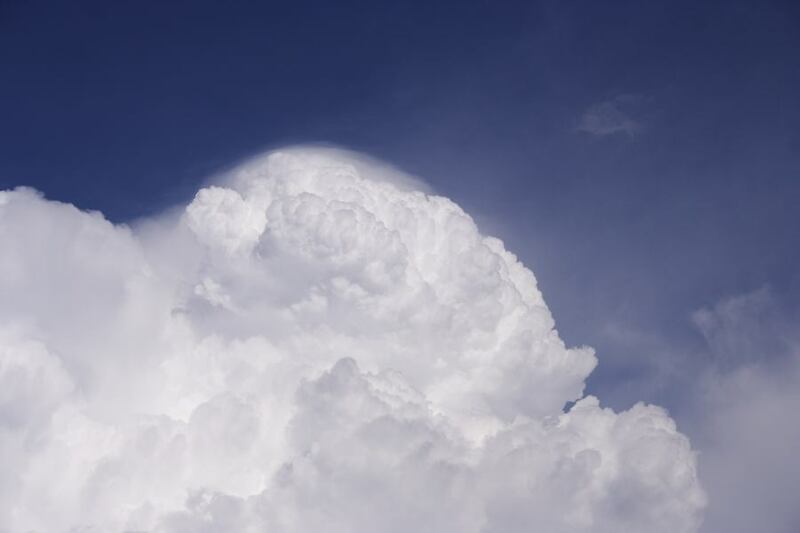 I took a couple of photographs and noted it sustained a solid back sheared anvil and an overshooting top for a considerable time including mammatus formations. Another cell followed it but collapsed. Thus there was morning activity over / off Sydney's eastern fringe and activity later on the ranges. Yes - David Croan and Ray were both hearing of thunder from these morning storms. I saw them but my angle did not offer a good perspective with the sunshine. Your perspective would have been better.